Take just a minute and look at this picture. Think about what facts you can clearly observe from this picture. North Portland I-5 Construction in the 60s. There are a lot of different things you can see. The most obvious is the clear path where block after block after block has been razed. To the left (west) 3 blocks you can see what is now Interstate Avenue. 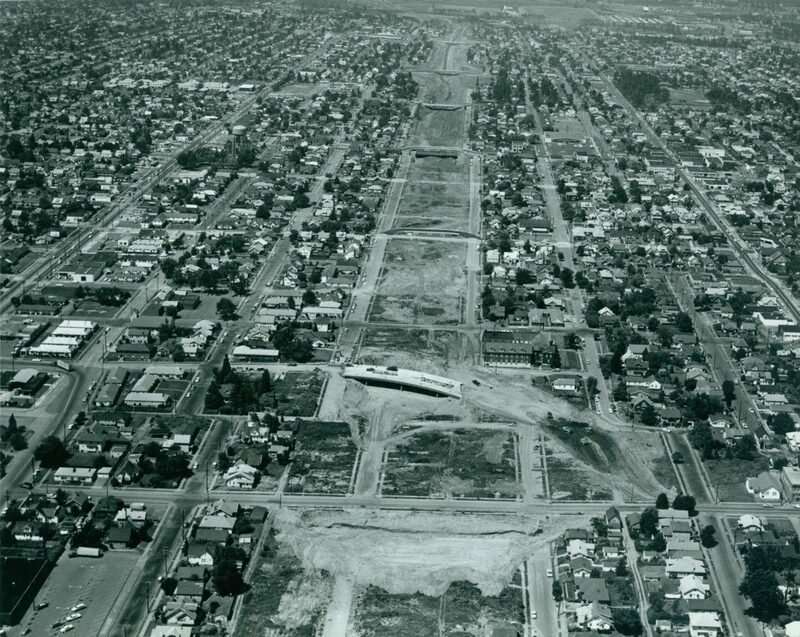 To the east you can see some other streets including what is now Albina/Mississippi. One of the things the I-5 corridor did when it was put into place was displace two significant minorities. The jewish population in south and northwest downtown Portland were displaced and in north Portland the African Communities were segmented and displaced. Most of the Interstate was built in a few specific ways. When it was forcefully inserted through the middle of cities, destroying urban areas and communities all over America, there were a few specific tools that politicians use. One was an unspoken discrimination. By finding the “impoverished minorities” they could easily sway the citizens to vote for paths through areas of a city that were considered blighted. It did not matter to these politicians and their constituents that these supposed blighted areas were peoples’ homes where they lived and owned homes. Yes, actually owned in many situations. But they were forcefully removed by sway of this, with a simple twist of eminent domain (the power to take private property for public use by a state, municipality, or private person or corporation authorized to exercise functions of public character, following the payment of just compensation to the owner of that property). The definition of course, is relevant, but absurd as the people in these areas that were razed were powerless to stop the Interstates from wrecking their homes, breaking apart their neighborhoods and segregating white from black, jew from christian, even more staunchly than a simple discrimination. The Interstate, in some ways acted as an unspoken discriminatory divide between people throughout the country. Research any interstate in the country, and almost always a city used these build outs as a way to separate people as much as to enable them. Freedom! …or chains that bind us? Of course, the largest achievement of the Interstates, more than any other thing has been in creating a country that is tightly coupled to auto-dependency and foreign oil. With more energy and travel time than any other civilized nation between work and home. At one time it might have been a lofty goal, but now it is becoming a more and more clearly marked mistake. Another thing we’re finding out more and more, even with efforts to suppress and keep media reports form coming out about this, is the rather at which people are killed (i.e. die from any cause not related to a natural death). I’m not talking about the dozens that are killed in vehicle wrecks, the children that are ran over from offloading high speed traffic on neighborhood streets, or related “vehicle” incidents. I’m talking about from poisons that I-5 gives us via the petroleum vehicles barreling up and down the interstate. Here’s some reading material if you want to see how many are dying, painfully, every year in Portland specifically but also in lands throughout the country. Originally, before starting to read the rest of the post what did you think when you say this image? Progress? Advancement? Efforts to build big things? Great things? Think again, the Interstate has never been a clear cut advancement for America. It’s always been shrouded in the idea of freedom, capitalism and the free-market. When it reality it is a large scale socialist re-distribution of funds from the haves to the have nots that have locked them into an auto dependent lifestyle. It was a redistribution that has given us massive traffic, lower economic throughput of goods (the railroad system we had in 1950 still exceeds the capability of actual good throughput by at least 2x in almost every part of the country. Tax Burden? Why do Republicans support this socialism? One of the largest burdens we have as taxpayers is in maintaining, building and extending the road system. The gas tax supplies ONLY part of the costs of road costs. If you took the entire amount of the money raised by gas taxes and applied it to the cost of the Interstates it would pay for about 95% of the costs. We’re quickly reaching a level though were the gas taxes don’t cover even that much of the Interstate, and we’re only covering about 0.5% of the costs of keeping up the Interstates, but we’re actually not spending the money on the roads but instead on new road construction. That means we’re actually only covering about 0.1-0.2% of maintenance and we’re adding to that by building MORE Interstates. This fact doesn’t include were even more money goes, into state highways, local roads, etc. We, as a society, with our current infrastructure taxes can’t afford this (technically we’ve never really been able to, we’ve been spending the last 60 years going into debt by selling bonds to China & other nations to fund our expansions). So when you look at this picture, think of it in a more holistic sense as the thing that’s put us on our current path to financial burdens our children can’t afford. An entitlement lifestyle that has Americans thinking they’re owed a road for everywhere they want to go, and that it be FREE! There’s more to our freeways than meets the eye, and everybody in this country needs to think a lot more about this and become more informed about what this infrastructure has led us into. Our children’s lives (or deaths) depend on it. If you read these I’ll have more cross-correlations and holistic views on why these things can be connected to our current plight in America, financially and otherwise. I’m officially starting a list of misbehaving, in a lethal sense, of any motorist that is risking others’ lives while they barrel around in their automobile. I’ll do the same for anybody that is wielding such a device that can cause instant death. I’m also going to work toward organizing a type of “Neighborhood Watch” to get these drivers ticked, with video evidence & more. I’m sick of hearing about “5 year old dead” because somebody is too busy in their life to pay attention and drive well. This first video, which I recorded today was of a lady in a 4-door Silver Gray Honda Accord, with license either T38 OSK or T38 DSK. There’s just too much death, to not put something together. Many of Portland’s Citizens have been trying to improve things for years now, it’s time to take a step further and let drivers know this is unacceptable behavior in our city, in any city really. If you’re a brave soul and interested in outreach and organizing, let me know. I’m sure I’ll need help with this. Cheers!